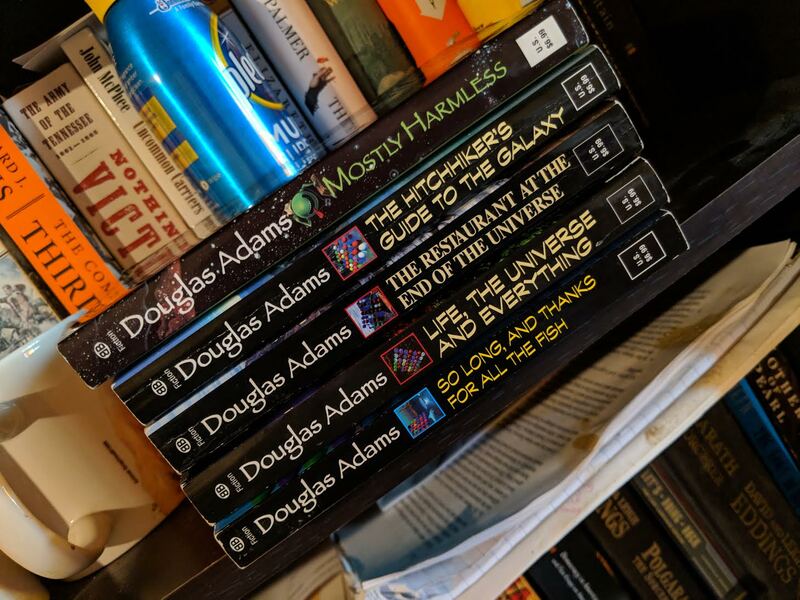 For my second Epic Bookshot, I spent a few months winding my way back through the zany and humorous science fiction antics of Douglas Adams' Hitch-Hiker's Guide To The Galaxy. I've always enjoyed these books, but it had been awhile since I had plunged into them- so it was a treat to work my way through them again, especially the last two books: So Long And Thanks For All The Fish and Mostly Harmless. These are the two books I've read the least, especially Fish. First of all, I suppose we have to touch on what makes this particular 'franchise' so fascinating: it's existed in just about every medium you can think of. It started as a radio show and has continued as a radio show over the years (I still have the cassette tapes we used to listen to on family vacation.) It's been a stage show, comic book, a TV series on the Beeb in 1981, a video game in 1984 and a feature film in 2005. Here's the hook with all of these mediums: every time it's moved into another iteration it's never been exactly the same. It's why the movie is different from the TV show, there are subtle differences (though not many) between the radio show and the TV series as well. Life, The Universe and Everything sees Arthur and Ford return to the present through a space-time eddy into Lord's Cricket Ground where they meet Slartibartfast who enlists their help to fight an ancient evil. The inhabitants of Krikkit long ago set out to destroy all life in the Universe and now they're back. Our heroes prevent this and then go about their separate ways. So, Long and Thanks For All The Fish is the next book and probably the one I've read the least, so it was probably the book I enjoyed the most overall. Arthur finds himself back on Earth and everything is more or less like it was when he left. He meets and falls in love with a girl named Fenchurch (who is a passing reference from the very first book) and discovers that the dolphins have provided a replacement Earth in their Save The Humans Campaign. Eventually the two meet up with Ford and go hitch hiking one last time to find God's Last Message to His Creation, which Marvin The Robot gets to read before dying. Mostly Harmless is the final novel in the series... (yes, I know there's And Another Thing... and The Salmon of Doubt and I'm being a true Adams compleist I should include them, but I don't own them, so therefore, ain't gonna read them.) Weirdly, this is also the one that feels most like a novel novel, if that makes sense. Life was adapted from a Doctor Who story that Adams wrote. Fish was also not adapted from radio script, but this one feels longer and more... I don't want to say fleshed out, but it's more substantial, maybe? (That's not the right word either. Let's just say it's got a different tone from the west of the series? That's probably closer to the mark.) Well, this one features Arthur who loses Fenchurch, has a daughter he never met and settles down on the planet Lamuella to become 'sandwich maker' to the natives there. Ford evades a takeover of the Guide by the Vogons and steals the Guide Mark II. Random (Arthur's daughter) steals the Guide and goes to a parallel Earth to try and meet her mother and ultimately causes the removal of all Earth's from all probabilities. Overall (and I guess thirdly): this is one of the great works of science fiction of the last century. There's a reason you find these on all those 'check off the books you've read' listicles that float around the internet- it's one of those rare series that transcends it's genre using humor. That, I think is a far more difficult way of writing that people can understand. Science fiction doesn't have to be ponderous and deep and meaningful and full of wonder and awe and escapism and transport you to other worlds. It can be smart and intelligent as well. I don't know if that's what Adams had in mind when he started writing these books, but that's what he delivered.